A livestock export vessel carrying 4237 cattle was forced to return to the Port of Portland yesterday when it began rolling from side to side soon after departure. The Australian Maritime Safety Authority (AMSA) has since detained the vessel and is conducting an investigation. The MV Jawan left Portland yesterday morning bound for Muscat in Oman. However, according to a statement issued by the Port of Portland, soon after departure it was evident the vessel was swaying from side to side and just after exiting the harbour the pilot turned the ship back and headed back to port. 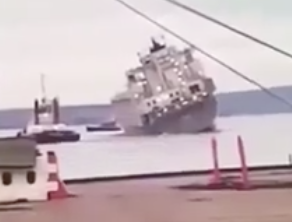 A video being circulated on social media (below) shows the vessel listing from side to side. A statement from the Port said it had been reported that there were no injuries to the cattle or any personnel onboard. The Jawan is a Panamanian flagged ship built in 2003 and owned by Mira International Shipping. It has been contracted to Livestock Shipping Services, but Beef Central’s inquiries today have not yet been able to determine if the vessel has been subchartered for this journey and which exporter is responsible for the stock on board. This is yet another example of the enormous stress on Australian livestock transported live to overseas countries. How can we, taxpayers, farmers, concerned citizens of this great country rely on the present Federal Government to govern responsibly by ensuring that animal welfare policies are adhered to by everyone involved in the transportation of livestock . Livestock transportation by sea must be completely banned. We’ve had enough trials, commissions, experiments! Livestock transportation by sea must be banned immediately.